Since it's monsoon, taking advantage of the favourable conditions and pleasant weather, my mum sowed seeds of some veggies, which are relatively easy to grow in containers. Most of these vegetable plants include creepers and vines and also some plants with smaller form factor. My mum sowed seeds of pumpkin, some beans, the ridge gourd and the bitter gourd, along with a couple of the regular chilly plants, some ginger plants, and the evergreen curry leaf plant. She had plans to have a few egg plants/brinjal plants but, I was a bit lazy to bring the saplings from the plant nursery, so they were shelved off. We planted some of these vegetable plants last year too, along with some cucumbers as well, but, were somewhat out of luck as my gardening space was drastically affected by some white mealybugs, and these obnoxious creatures had invaded almost all my plants. The green leaf eating caterpillars were a feature that had invaded as soon as some of my veggie vines grew a bit. Last year, the invasion was so much drastic that I had to uproot all my vines and burn them just before any of them began to bear any fruits. Though the cucumber had some fruits, but, the results were not good, so, this time we let cucumbers go. The invasion of these caterpillars, no matter whether they are larvae of butterflies of what, isn’t acceptable to me. Though I like butterflies, I don’t like their larvae eating up my plants. Whenever I see any of my plant leaves eaten up, I lookout for the culprit and manually remove them and finally kill them. No caterpillars are allowed in my space! Then come the leaf miners. These specifically target the soft leaves of the beans, and other plants. The adults lay their eggs on the leaf surface and once these eggs hatch, the larva penetrates inside the surface of the leaf, making it its home for the next few days and over this time the larva feeds on the tissues of the leaf. The sign of the invasion of these on your plants can be easily identified, as these leave a white coloured trail as they move in between the upper and lower surface of the leaves. You can actually find these creatures as a small dark coloured patch at one of the ends of the trail. Anyways, now, moving on to this year’s growing season, I now have some very healthy plants and vines flowering and fruiting. The pumpkin (kaddu) plant is bearing some flowers and one that has a small fruit on it. 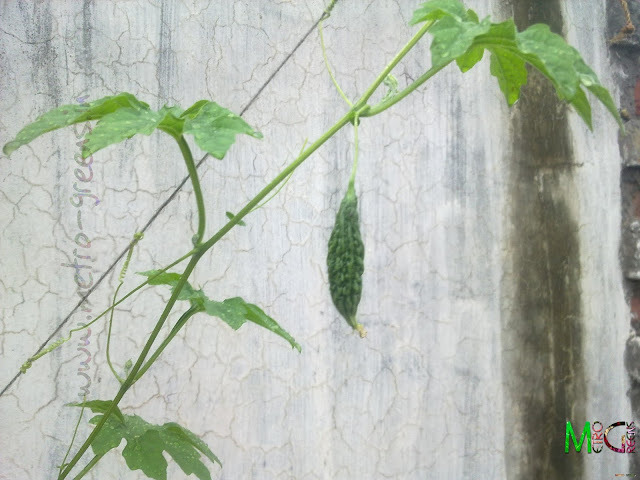 Same is the case with the bitter gourd (karela). 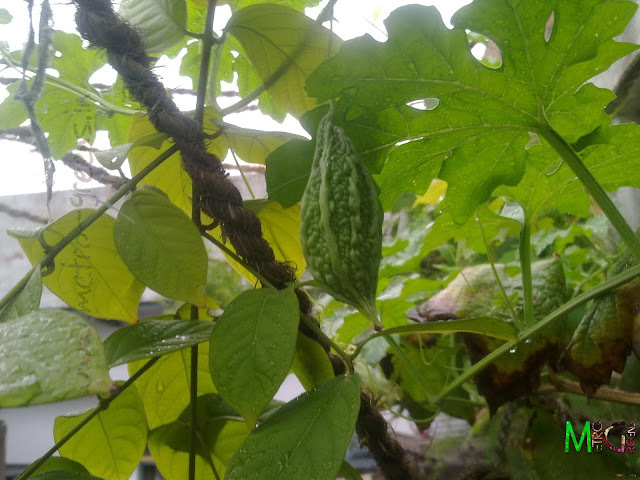 There are about 3-4 small fruits hanging on the vine. The beans haven’t reached the flowering stage yet, so, I believe there is still some time. 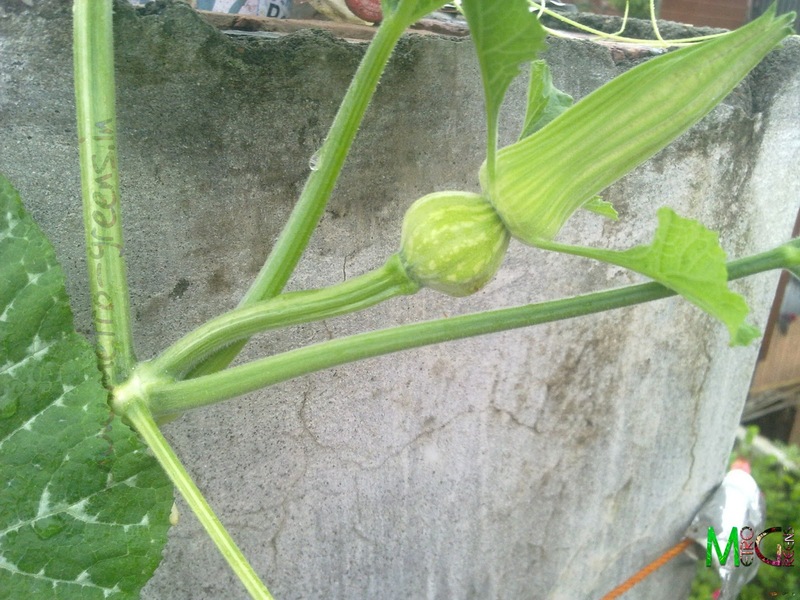 The ridge gourd (tori) is bearing some flowers, but, I still can’t see any flowers which will bear any fruits, so I’m eagerly waiting for some fruits of that too. 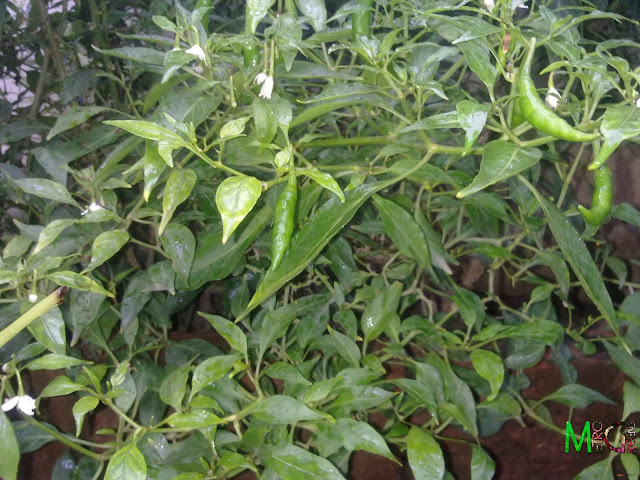 Apart from these newly planted ones, my chilly plants are blooming and are bearing some green chillies as usual. This is one plant that bears fruits almost all round the year. Right now I have around 6-8 of these chilly plants, which give me around 250 gms of fresh homegrown green chillies once in a while. I know it doesn’t sound much, but, as a gardener, it’s a prize for your hard work, even if it brings tears in your eyes when you go and have it. Then I have the ginger plants. All of these have been planted a few weeks back, in the midst of a drastic rise in the price of ginger, so there’s no question of having any fruits. Here I have some shots of what’s growing in my gardening space for you to watch and enjoy. Who knows while reading this post, you decide to give a try to gardening. The small hope for a huge pumpkin. This, definitely is a bitter gourd. I hope that the above pics would be somewhat inspiration to atleast some of my readers. If not from the feeling of self grown veggies, then atleast from the ever increasing inflation that drastically affects veggies in our plates. I will be back with some more interesting and inspiring posts. Till then, keep visiting and HAPPY GARDENING! One question, if I want to plant chillies, what's the right time? Thanks for visiting my blog and commenting. I suppose in case of chillies time doesn't matter as long as you're not sowing it in winters. Monsoon's a good time, you can just sprinkle the seeds from dried red chillies now and then wait for about 2-3 months to get some chillies. I'll look forward for some great chillies.